By Stacey Stein--If you can imagine what a mobile arcade looks like, then you’ll have a pretty good idea of what to expect when you encounter the Sony PlayStation Big Rig at the UJA Walk with Israel’s Renee & Irwin Nadal Festival, which begins at 12 p.m. at Ontario Place on Monday, May 21st. The Sony PlayStation Big Rig is an enormous air conditioned truck equipped with 13 PlayStation 3 gaming areas, 1 PlayStation Move, four PlayStation Vitas (Sony’s new handheld gaming system) and a VIP gaming lounge. The truck promises to provide hours of entertainment for kids of all ages. Jamie Wise, who is chairing this year’s Walk along with co-Chairs Lauren Wise, Micki Mizrahi and Sam Mizrahi, says that he has fond memories of the Walk and the festival from years past. This year’s festival will be jam-packed with fun activities for the whole family, including camel rides courtesy of Bowmanville Zoo, a petting zoo sponsored by the Toronto Heschel School, the IBI Architects Israeli Art Centre, amusement rides sponsored by the Forest Hill Jewish Learning Centre, a delicious kosher food court, and, of course, the Walk’s famous kosher barbeque, sponsored by Mizrahi Design Build. There will also be a main stage filled with entertainment, music and dancing. Walk festivities begin with the Walk kick-off party at 9 a.m. at Coronation Park, where we’ll be treated to a special guest appearance by popular hip hop/R&B star JRDN. 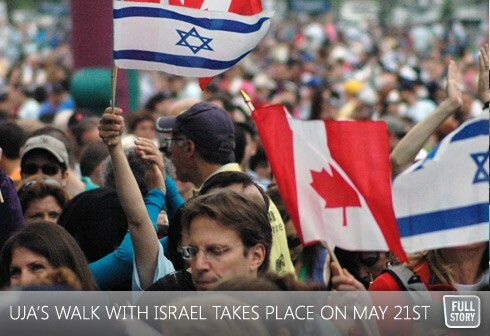 At 10 a.m. we’ll hit the streets of downtown Toronto in an incredible display of solidarity with our Jewish homeland. And then it’s time to let loose at the Renee & Irwin Nadal Festival. Money raised by the Walk with Israel helps fund UJA’s ongoing transformative projects in Israel.